The saxon 8-20x25 Traveller Binoculars are a travel lover’s dream! Perfect for savouring nature and architecture, these variable zoom binoculars allows you to focus in on your intended object with ease. Don’t miss a moment of your special trip with these lightweight, durable and must-have binoculars! Create memories that last a lifetime when you take these saxon 10-30x25 Traveller Binoculars on all your adventures. These rugged binoculars are built tough to travel with you and feature an ergonomic design for more comfortable viewing. Their lightweight design makes them ideal for carrying on your expeditions. 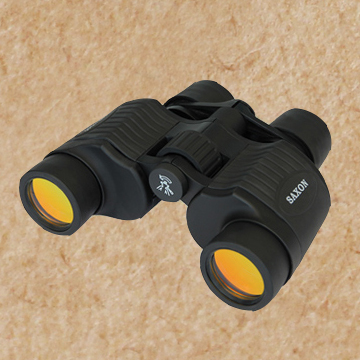 The saxon 10-30x50 Scouter Binoculars is a great combination of quality and affordability. These binoculars feature a variable zoom of 10-30x, 50mm objective lens, center focusing, multi-coated optics and fold-down eyecups. The rubber-armour body and ergonomic design makes it a great option for both indoor and outdoor use. The saxon 10-30x60 Scouter Binoculars are great for zooming in on your target even on low-light conditions. With a variable zoom of 10-30x, 60mm objective lens encased in a sturdy rubber body, these binoculars are suitable to bring on your fishing, camping, even stargazing trips! Carry these binoculars with you everywhere in its soft carry case or around your neck with the attached strap. Designed for long-distance views of both land and sky, the saxon 25-125x80 Scouter Binoculars is a powerful pair of zoom binoculars that offers excellent optical performance. These binoculars are feature-packed with its variable magnification of 25x-125x, huge objective lens of 80mm, BaK-4 prisms, fully multi-coated lens, long eye-relief, fold-down eyecups, built-in tripod mount and center stabiliser rod. Invest in your hobby with these sturdy, reliable pair of binoculars that promises years of breathtaking views for years to come.